Sgt. Pool of Paducah, Ky., and Sgt. Harrison of Mayfield, Ky., won the National Guard FLW Soldier Appreciation Tournament with three bass weighing 12 pounds, 6 ounces. Sgt. Pool of Paducah, Ky., and Sgt. Harrison of Mayfield, Ky., won the National Guard FLW Soldier Appreciation Tournament held on Kentucky Lake Saturday. The team, fishing with pro Roy Hawk, caught three bass for a total of 12 pounds, 6 ounces to take the title and bragging rights amongst their peers. Storms threatened the skies early during the tournament, but the weather didn't slow down the fishermen. "The weather was fine for about 30 minutes and then it started to get real bad," Pool said. "The rain started pouring down, the wind was real bad and the water was rough, but we were out there to just do the best we could to catch any kind of fish that we could catch. Roy got us on the big fish fore sure, and we really appreciate that." 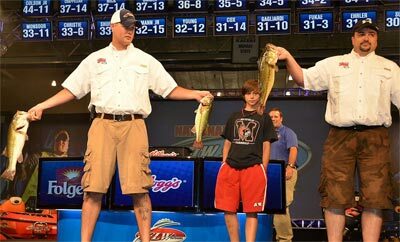 "This is the first time I've ever fished in a tournament and it feels great to win it," Harrison added. "Especially since our unit is from here in Murray. We were proud to represent them." Each of the participants in the National Guard FLW Soldier Appreciation Tournament are members of the National Guard. In this tournament, Walmart FLW Tour pro anglers took teams of two members of the National Guard fishing to compete amongst their peers. Each team was allowed to bring in three bass. FLW Outdoors is operating the tournaments in conjunction with the National Guard to show appreciation to our service members of the National Guard. "We mainly threw ½- and ¾-ounce Pepper Jigs Custom Baits," Hawk said. "We caught them on both points and ledges. "It means a ton to me to take these guys fishing because it gives me the opportunity to actually give something back to them because they've given so much to us," Hawk added. "Having this tournament set up to give back to them is really special. We appreciate all they do and their sacrifice." The Soldier Appreciation Tournament was held in conjunction with the Walmart FLW Tour on Kentucky Lake presented by Kellogg's and hosted by the Murray Convention and Visitors Bureau and the Marshall County Tourist Commission. For complete details and updated information visit FLWOutdoors.com. For regular updates, photos, tournament news and more, follow National Guard FLW Fishing on Facebook at Facebook.com/NationalGuardFLWFishing and on Twitter at Twitter.com/FLWOutdoors.